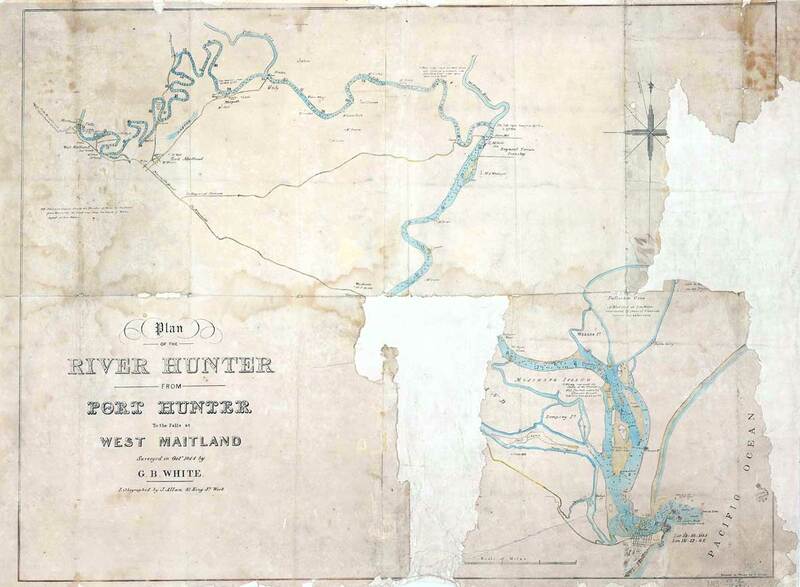 Plan of the River Hunter from Port Hunter to the Falls at West Maitland, 1844, by George Boyle White, from the University of Newcastle, Cultural Collections. George Boyle White immigrated to New South Wales from London. Although he was from the upper social he had few prospects and little money. After leaving the navy, he followed family members New South Wales to seek his fortune. White volunteered to do survey work with Henry Dangar, which soon landed him the job of a government surveyor. George surveyed Maitland starting from 1829. His work continued as he surveyed land for the AA Company, and large tracts of the Hunter Valley including Muswellbrook (known to him as Muscle Brook), parts of Newcastle, Paterson, Raymond Terrace, Gosforth and Rothbury. He also closely studied and mapped the Hunter River, recording flood levels. Between his work trips, he built a homestead near Singleton named ‘Greenwood. White was also a keen diarist, keeping detailed accounts of his life. These diaries are highly valued today as they give a glimpse into colonial life in the Hunter Valley. Dec 2008, p. 126-146. Accessed at http://www.georgeboylewhite.com/surveyor/.